The abbey of Mont St Eloi is located on a ridge north of the city of Arras. An abbey was first built here in the seventh century but the buildings that became a landmark on the Arras front date from the eighteenth century. Fighting raged around St Eloi in 1914 and 1915, as the French advanced on the nearby Notre Dame de Lorette and Vimy Ridge. Shells damaged the main towers and much of the main abbey building. 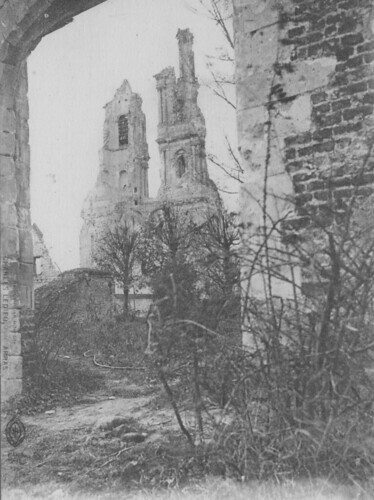 When the British came to Arras in 1916 they established billets in Mont St Eloi, medical facilities, gun sites and a Royal Flying Corps aerodrome beneath the twin towers of the abbey. Thousands of troops were here in the lead-up to the Battle of Arras in April 1917 and again when the fighting returning in 1918. It was even said that a pilot flew between the towers in 1918! 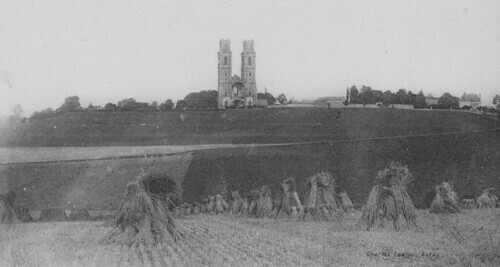 To many who served on the Arras front, it was very much a local landmark. Today the towers of Mont St Eloi are a protected French national monument and very much part of local tourism in the Pas de Calais. This entry was posted on 10/10/2012 by sommecourt. It was filed under Arras, Battlefields, France, Great War, Western Front, WW1 and was tagged with 1914-1918, 1915, Arras, France, Mont St Eloi, Pas de Calais.